One of my favorite breakfasts is a simple dish called Chirer Polao. It’s made of chire, or beaten rice – a dry, flaky, flattened version of the rice grains you buy in bulk. It’ll expand when soaked in water. The chire is cooked with whole and powdered spices, onions, green peas and potatoes. Chirer polao can be eaten as a snack during teatime too! 2) Remove them from the oil and set aside. 3) While the oil is still hot, sautee the cubed potatoes for 4-5 minutes until they turn a golden brown color. 4) Remove these from oil and set aside. 7) As the onions become slightly translucent, sprinkle powdered asafetida, turmeric powder, and salt. 8) Mix all together and turn off the heat. 9) Then wash the chire with water and drain it in a colander. If you used thick chire, you could have washed it earlier and left it after draining. The thin, flaky kind needs to be used immediately after washing. 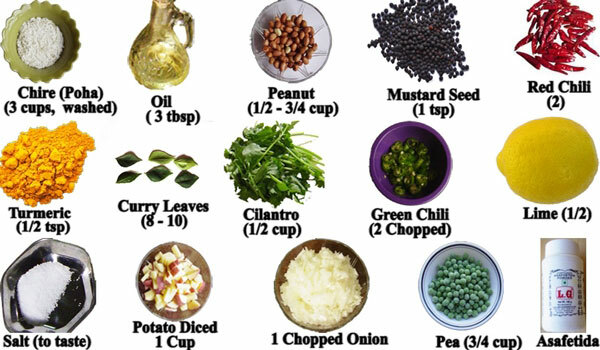 10) Turn the heat back on (we turned it off while washing the chire so that the onions and spices didn’t burn) and add the chire, peanuts, potatoes, green peas, lemon/lime juice and stir until the mixture becomes hot again. 11) Garnish with chopped cilantro.